After months of negotiations, the US global retail giant Walmart Inc has been able to strike a deal with Flipkart, India's most valuable startup. According to a Bloomberg report, Flipkart Online Services Pvt has approved 75 per cent stake sale to Walmart for $15 billion. Tech giant Google's parent company Alphabet Inc would also tag along with Walmart for an investment in Flipkart. As per the deal, SoftBank Group Corp, which is one of the biggest investors in Flipkart, through its Vision Fund, would sell its 20-plus per cent stake in the company for around $20 billion valuation. The report claims the deal can't be called certain, and that terms could change in the next 10 days. The US retail giant was in talks with Flipkart for around a year to acquire a controlling stake in the firm as it looks to take on rival Amazon.com Inc head-on in India, a market where e-commerce is tipped to grow to $200 billion in a decade. Experts say the Amercian company could bag four of the 10 seats on Flipkart's board. Some of Flipkart's main investors - US hedge fund Tiger Global Management, South African tech investor Naspers and venture capital firm Accel - are likely to retain small stakes, the report said. Currently, SoftBank and Tiger Global own little more than 20 per cent each of Flipkart, Naspers holds nearly 13 per cent stake, Accel 6.4 per cent, while the Bansals own just over 5 per cent each of the company. 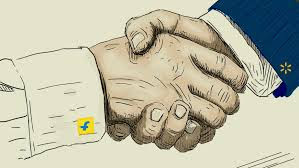 On May 3, world's biggest e-commerce player Amazon, which is Flipkart's main competitor in India, had made a counter offer to Flipkart to buy a 60 per cent stake in the company. The deal offered by the Jeff Bezos-run company proposed to merge Flipkart entirely with its Indian arm and sought a non-compete agreement with Flipkart's founders for 1-2 years. However, the Flipkart board's decision to take the Walmart offer will make it easy to get the regulatory approval. Any Flipkart-Amazon deal would have come under the scanner of the competition watchdog given their dominant market share - around 70 per cent collectively - in the Indian e-commerce market. Once the acquisition process is complete, Flipkart's Executive Chairman Sachin Bansal may hang up his boots after taking company to new heights in the past 10 years, reports suggest.